Amazing! Lif Is Burnin' Up the Place! Edans guest production and vocals make this a Primo Release.One of the Hottest Definitive Jux Releases to Boot! 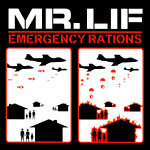 Music: 1 & 8 El-P, 2 & 4 Mr. Lif, 3 & 6 Edan, 5 DJ Hype, 7 Fakts One. Art Direction, design and illustration by Dan Ezra for delstudios.